Things are pretty good right now for investors. The market has been solid and inflation has been tame. But some people are concerned about the future. And I believe more will become increasingly anxious in the near term as interest rates start to go up. This is especially acute for retired people and for people planning their retirement. What Are Retired People Worried About And Why? I can’t speak for everyone of course, but I know that some are unsettled when they look at government spending, inflation, interest rates and marginal tax brackets. I spoke to Don on Friday and he was plenty worried. 1. The government is in debt up to it’s eyeballs. 2. In order to make up for the shortfall, the politicians in Washington will continue to print money like Willy Wonka produced chocolate. Our elected officials may not have any Oompa Loompas available to man the presses, but they do have the ability to print up as much green stuff as they want. Yes again. This is possible and if it does occur it will create inflation. 3. In order to make up for the spending deficits the government will likely increase income tax rates. Trifecta! Yes…Don made good arguments and it’s hard to argue against his logic. But I still urged him not to worry too much. Let me explain why. 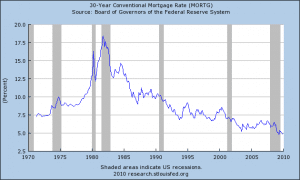 Why You Really Shouldn’t Worry About Interest Rates and Tax Brackets Long Term. Even though there are certainly plenty of challenges ahead, these kinds of problems are usually transitory. Sure taxes and inflation could rise, but they will ebb and flow. Nothing is forever. When things are good, it feels like they will stay good. When things are bad, it feels like there is no way out. Neither is true. Sadly, good situations deteriorate over time. Difficulties come but eventually we find solutions. That’s they way it works over the long-term. I think Don was right to be concerned about these realities in the short term, but I believe he made a mistake when he concluded that these problems would plague us for the next 10, 20 or 30 years. The first graph shows a history of interest rates. Yes they could go much higher. But historically, we see that they probably won’t stay high if they do rise. Rates go up and down. The same is true with respect to inflation. The second graph reflects that. And the third graph shows that tax rates climb and fall all the time too. Why do these things change all the time? Because people who live in democracies get to throw policy makers out once we get good and sick of their idiocracy (a new word I think I just made up – but useful). And there is also this little thing called the “business cycle,” which even the politicians haven’t been unable to completely destroy – at least so far. 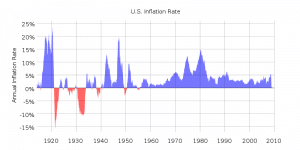 Bottom line, it makes sense to be concerned about higher inflation, interest rates and tax brackets in the near term. But you need to maintain perspective. And if you convince yourself that once these problems manifest, they are here to stay, you are ignoring the facts. So when you think about planning your retirement and you’re looking for solutions, please keep in mind that you’ll likely experience many cycles of high and low interest rates, tax brackets and inflation. You can’t predict when these periods will come or how long they’ll last. But you can plan on them coming and going. Do you buy my argument, or do you think inflation is just around the corner and when it gets here, it’s here to stay? Would now be the time to buy bonds? Especially if nearing retirement?